Twenty years ago I met a graduate student from MIT at the outdoor canteen (cafeteria) just next to the Olympic-sized swimming pool at my grad school in Hong Kong. She was researching early language acquisition and how even if someone stops using a language acquired at young age, it’s still there. She was studying a southern Chinese dialect from an area not too far from Hong Kong. This would hit close to home years later when my oldest son would re-learn the Chinese dialect he heard on a daily basis his first two years of life, but not after that. 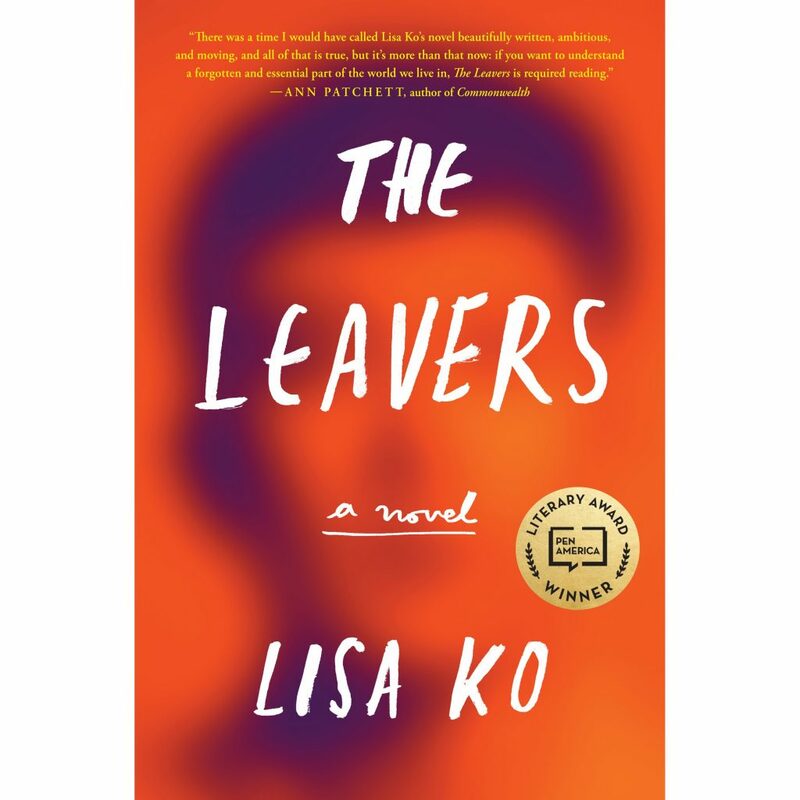 Lisa Ko writes about early language acquisition and so much more in her stellar debut novel, The Leavers. Her story centers around a Chinese immigrant named Polly Guo, who moves to New York pregnant with a son she names Deming. It’s the 90s and China is not the country of wealth and opportunity it is today. People are desperate to leave for a better life, and at any cost. Polly, like so many fellow compatriots from Fujian Province, does whatever she can to get to the US. In New York, Polly works in a clothing sweatshop, but when Deming is born she has a dilemma. She has no family in the US to take care of him while she’s at work, but if she hires a sitter, all her salary would go to the caregiver. And she wouldn’t be able to pay back the $50,000 she borrowed to pay the snakehead to get her to the US. Or the money she is expected to send to her father back in Fujian. After a six-month leave from her job to care for baby Deming, Polly is still at a loss for what to do about childcare. Her coworkers encourage her to send him back to Fujian to live with her father. It’s the last thing Polly wants to do. Deming is the only family she has in the US and she can’t bear to part with him. But there’s no other way. Deming lives in China for more than five years and returns to live with Polly in New York after her father dies. Before Deming returns, Polly meets a kind butcher–also from Fujian–named Leon who lives with his sister in the Bronx. Leon works odd hours at a slaughterhouse and his sister, Vivian, is home sometimes when she can take in sewing jobs. Vivian is also a single mother and has a son named Michael. So Polly and Deming move in with Leon, Vivian, and Michael. The two boys become very close and look out for one another. Then one day Polly disappears. No one hears from her, not Leon, not Vivian, not Deming or Polly’s best friend at work. Leon and Vivian figure she abandoned them after they call Immigration to see if she’d been arrested in a raid. But Immigration has no record of a Polly Guo. It seems as though she disappeared and it’s very, very confusing for Deming. He naturally blames himself, as kids tend to do when something horrible happens to their families. Leon returns to China six months after Polly disappears. Vivian can’t take care of both boys without Polly’s and Leon’s salaries. She can’t even stay in their apartment with just her salary. She brings Deming to child services one day and he’s sent to a Chinese foster family for a short while. Deming thinks it’s just temporary. He’s about ten or eleven years old and still feels completely responsible for his mother’s disappearance (had he done something to make her leave?). But instead of returning home to Vivian and Michael, Deming is sent to another foster family, this time to a white couple in Upstate New York. Deming Guo becomes Daniel Wilkinson and he does all he can at a young age to find his mother, to no avail. Kay and Peter Wilkinson soon adopt Daniel. All hope of finding his mother and returning to his old life vanish. Ten years later, Michael finds Daniel. The two are both in their early twenties and have gone in different directions. Daniel has so many questions about his mother, and also about Vivian and Leon and why they let him leave their lives after his mother disappeared. But Daniel isn’t sure he wants to find the truth. Would that hurt even more than the fact that his mother disappeared a decade earlier and there’s been no trace of her since then? I love this book for so many reasons. For showing how incredibly difficult it was for Chinese immigrants to get to the US in the 90s. And how hard they work in grueling jobs that other Americans don’t want to do: hot and exhausting days in sweatshops, picking under other women’s nails and waxing them in other areas in cheap salons, and back-breaking jobs in slaughterhouses, not to mention everything that goes into running a Chinese restaurant. And when the economy and opportunities improve in China, many immigrants return because they suddenly have better working conditions in a place where the culture and language are familiar. It’s not just that, but also that in China they aren’t invisible or treated poorly. Lisa Ko’s characters show how difficult it is for women immigrants who have to deal with child care, often on their own, and housework and many more responsibilities than just going to work each day and paying the bills. Polly’s dilemma about keeping Deming in the US and not earning enough money to pay her debts and support herself versus sending him back to China until he starts school was quite a common practice in the 80s and 90s. No parent wants to be separated from his or her child, but what other choice was there? She also writes about pressures of first generation children to please their parents and how addiction is color blind. And she brings up many issues related to international adoption. Identity is a huge part of this. The Leavers is one of the most powerful books I’ve read in a long time. I finished it feeling sad and angry and hopeful. If you’re looking for a gripping book for the end of the summer, I’d say there’s no better choice than The Leavers.